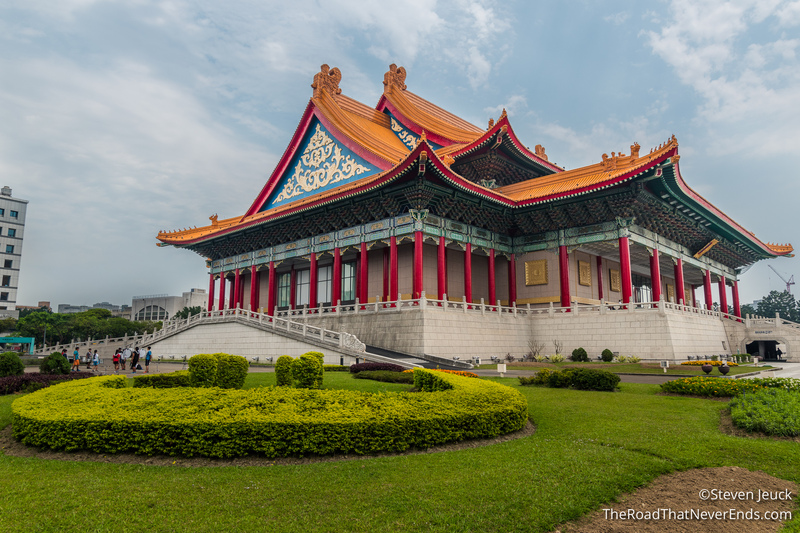 We had good reason to “skip ahead” and visit Taipei next – a visit with friends! We found out our friends Celia, Cary and Kent would be in Taipei during this week, so we had to figure out a way to see them. 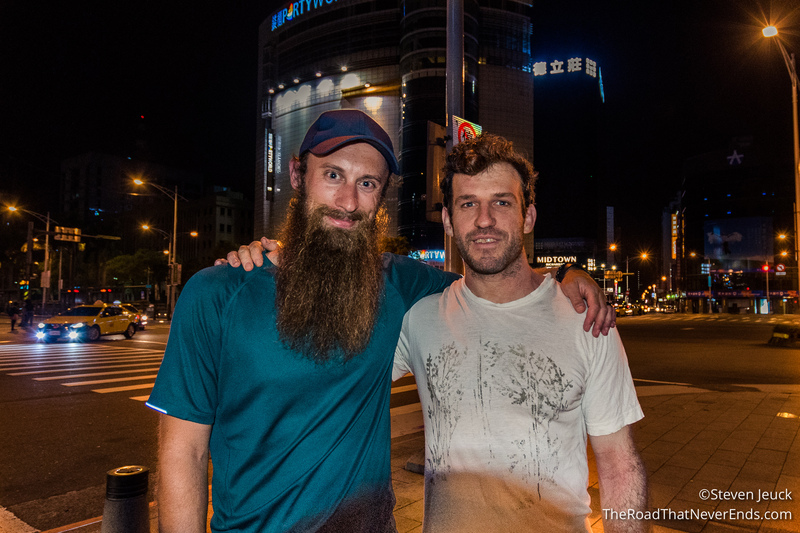 We also had the opportunity to see Steve’s friend, Brian, who has lived in Taipei for almost 6 years. 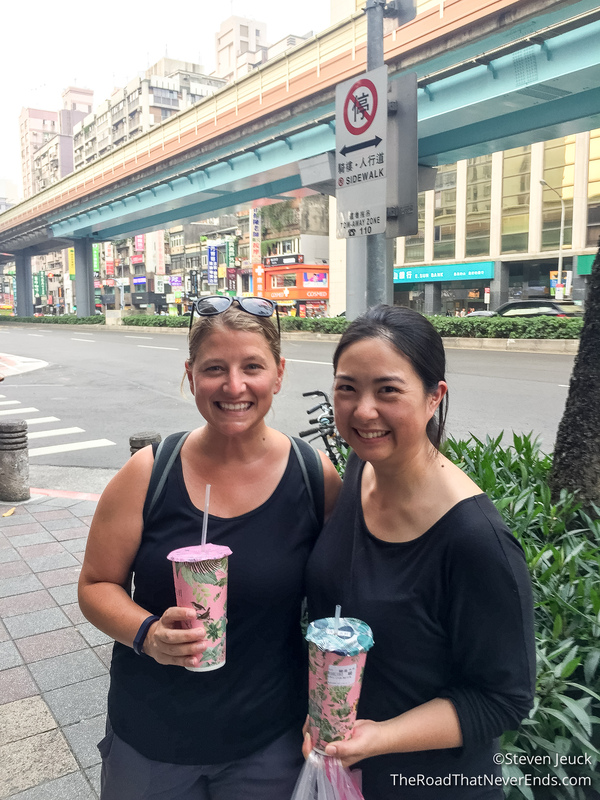 Besides visiting with friends, we felt Taipei was an amazing city with a lot of culture, food, nature, and… FOOD to offer visitors. We flew on United miles to Taipei on Thai Airways, with a stop in Hanoi. Our quick stop in Hanoi was nice because we will be there in a few weeks. It allowed us to get acquainted with the airport and more importantly airport food. 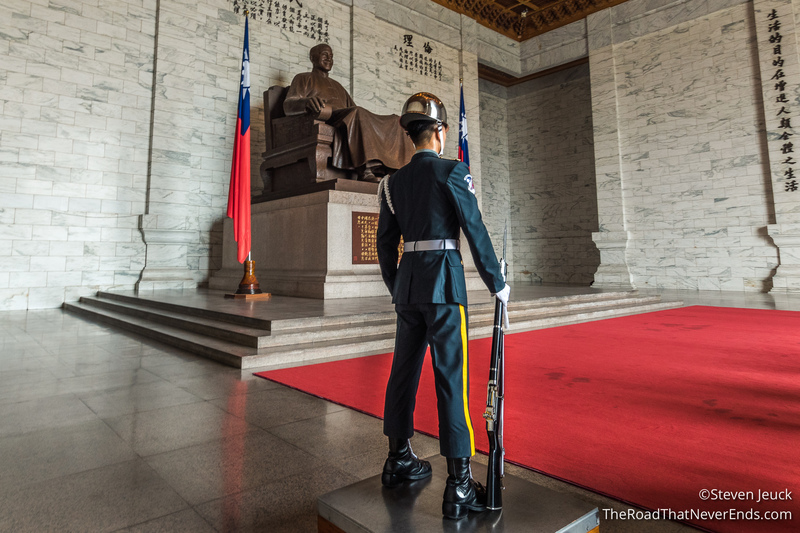 Once arriving in Taipei, we took the Airport Bus 1819 to our hotel. We took the bus because it runs every ten minutes, takes 50 minutes get to the city, cheap, and dropped us off only a block from our hotel. The bus was nice and comfortable as well. From the airport arrival, we walked to the bus lounge and bought a ticket easily at the counter. The attendant was nice enough to give us a map and circled the stop we were to get off at. Throughout our time in Taipei, we rode MRT everywhere. The MRT was clean, cheap, comfortable, and nice, although not always air-conditioned. The ticket machines were also extremely easy to use as well. MRT is pretty big, and we found that most places at a nearby station. We did take the Airport MRT back to the airport when we left Taiwan. We caught the express train from city center to the airport, and it takes you directly to the terminal. We thought this was a nice alternative to the bus, if your hotel is near Taipei Main station. 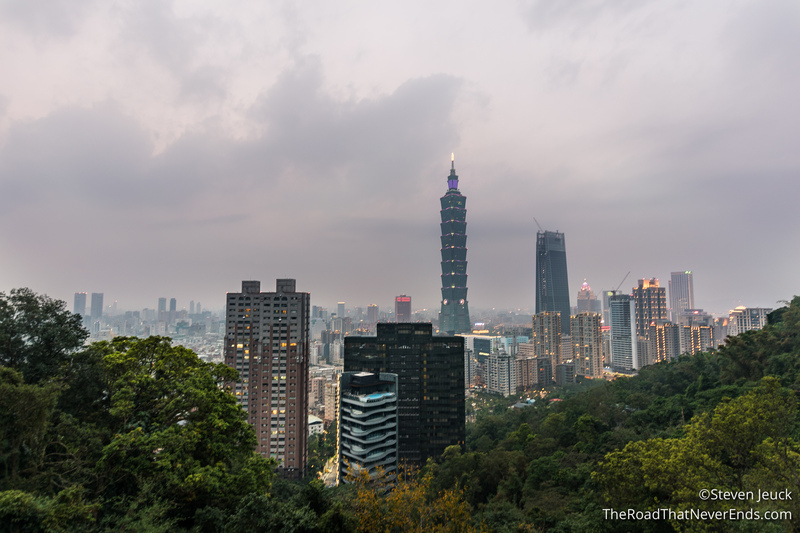 We stayed at Shin Shih Hotel, which was only two MRT stations away from Taipei Main. We thought the location was fantastic, as we had plenty of restaurants near us, and the MRT was only a 5-minute walk away. Like any cheap hotel in a metropolitan city, the room was small, the bathroom was small, and our view was of a brick wall – all of which doesn’t bother us. The only bummer to the room was the poor air circulation. If you don’t know, we do most of our laundry in the tub or sink, and then hang dry in the bathroom or room with our amazing pin-less clothesline (if we are unable to find a laundromat nearby). This time, when doing our wash, the clothes did not dry – at all. It took over a day, which meant our clothes smelled like mildew. I had to use the blow dryer several times for desperate situations. Our only hope was that our friends couldn’t smell how terrible our clothes stunk. We ended up rewashing the clothes later because it smelled that bad (preview – we had this incident happen again later – stay tuned). I mentioned earlier that we were lucky enough to see some amazing friends. We have been away from the bay area for over 200 days, so to see someone you know instantly brings you feelings of home. I had said in a few blogs that between the two of us, I am the one that’s homesick, so seeing my friends meant a lot to me. Celia, Cary & Family – We met with Celia, Cary and their family the night we arrived for dinner. 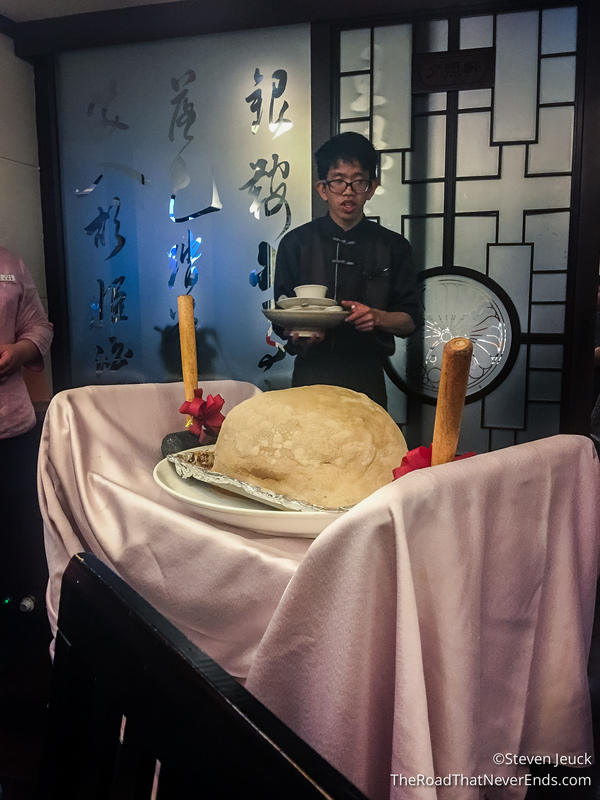 They had something very special planned for us, a traditional Chinese dinner. Steve and I loved the variety of good Chinese food, great tea and wonderful conversation. Our highlight of the evening was watching the kids crack open the beggar’s chicken. After dinner, we strolled through one of many malls in Taipei. The next day we met Celia and Cary for a foot massage and tea! It was Steve’s first time having a foot massage! I thought the foot massage was just what I needed. We walked through street markets and used Cary’s theory – find the bubble tea with the biggest line. We did, and waited 45 minutes for the bubble tea! It was delicious! We really enjoyed spending time with Cary & Celia and felt so lucky we got to catch up with them and their family. Thanks Celia & Cary!!! The next day, we planned to see our friend Kent for dinner, but actually bumped into him at the National Palace Museum. 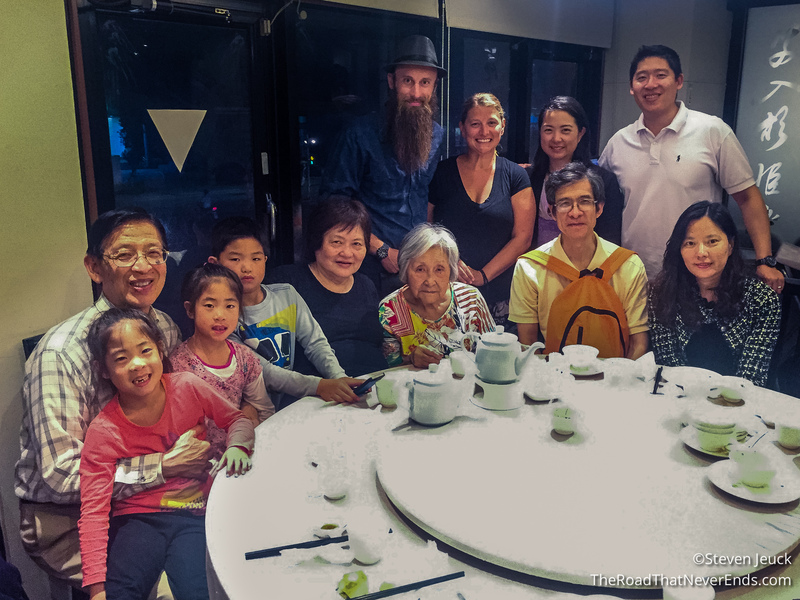 We got to see his son, David, and meet their friends who live part time in Taipei. 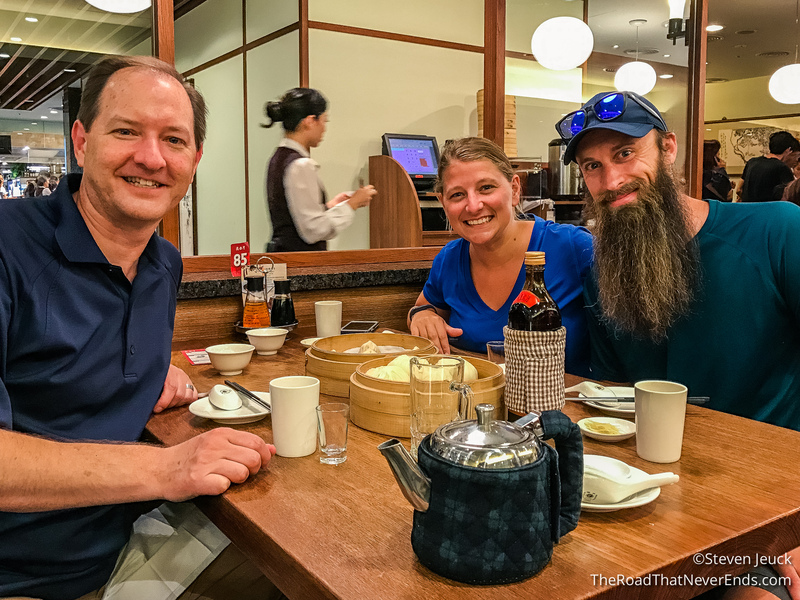 We later met up with Kent at Din Tai Fung, except Steve and I showed up at the wrong one across town. Luckily, Kent was patient and forgiving and waited 45 minutes for us to take the train uptown to the correct restaurant. Our dinner was quite memorable – rice wine, which I didn’t care for; and truffle dumplings – which is as amazing as it sounds. Catching up with Kent was fantastic! I am so happy he and his family are doing well! Thanks Kent for meeting us, and sorry to keep you waiting! We had one more friend to meet, Brian. Brian and Steve went to Ex`pression College together many years ago though actually met in high school through mutual friends. Brian lives in Taipei and follows his passion – music. Making music, playing in a band and teaching music. Brian showed us around Ximending area, which is sort of like Taipei’s Times Square. He was nice enough to help us pick up our train tickets for the next morning (his Mandarin skills were much appreciated) . We enjoyed a drink and more conversation. We are hoping we will meet up with him and his girlfriend in Shanghai in a few weeks! Thanks Brian!! I can imagine foodies from all over the world enjoying time in Taipei. Steve and I ate our way around town, but there are a few items/places that stick out to us. Bubble Tea – Did you know it was created in Taiwan!? My love for bubble tea started a few years ago when Celia took me to Tpumps in San Mateo, and since then, I have been hooked. They are just as delicious here! 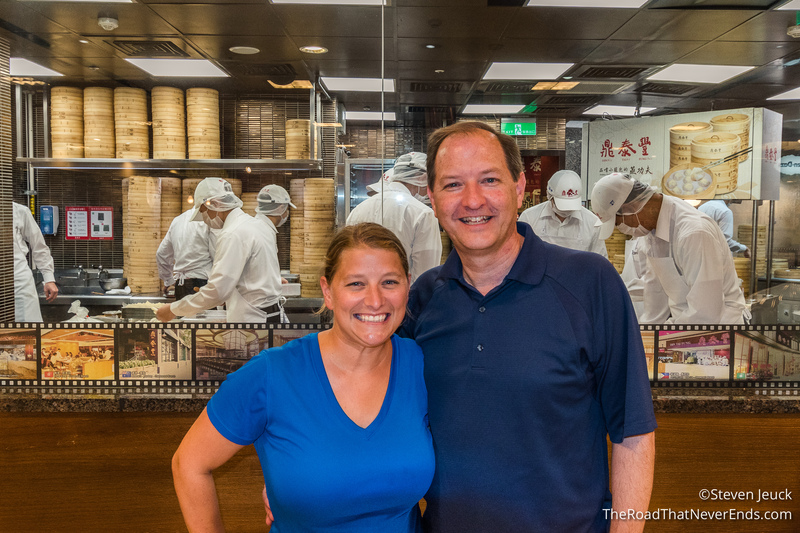 Dumplings & Steamed Buns – we went to Din Tai Fung – twice. The dumplings and steamed buns were SOOOOOOOO GOOD. We also enjoyed finding hidden gem dumpling places on the street. Baked goods – Celia advised us to try bakery items, so we did. Using the “Cary Theory” we went to the bakery with the most people. We ended up trying the Taiwanese Macaroons, and another item which I don’t know the name of. I really enjoyed them. Steve is not much into sweets, so he left them for me to enjoy (oh darn!). 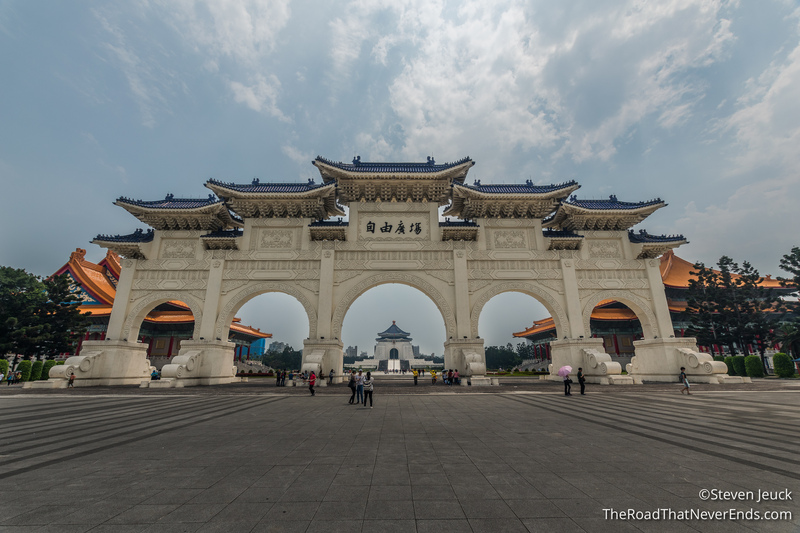 Liberty Square – A large plaza, and home to three main monuments: Chiang Kai-shek Memorial Hall (see below), National Theater, and National Concert Hall. While visiting we witnessed people practicing dance, drums, tai chi, and more. It seems to be an active place for locals. 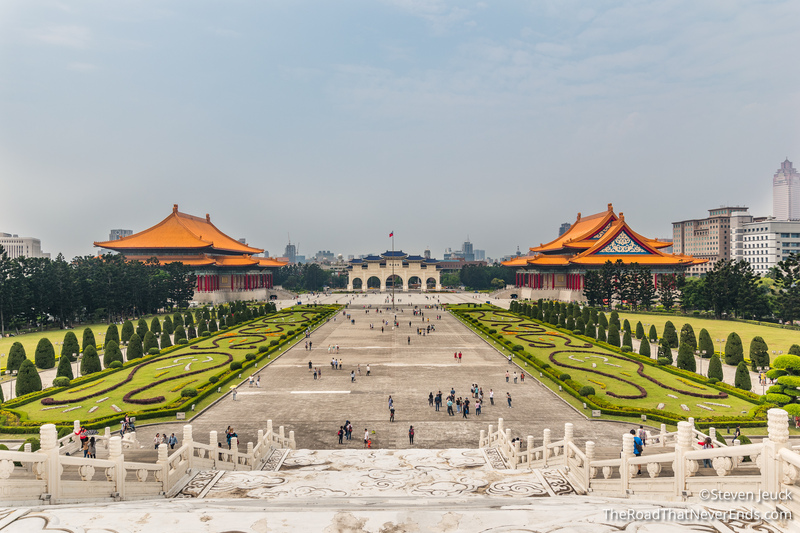 Chiang Kai-shek Memorial Hall – This memorial is dedicated to former President Chiang Kai-shek. He passed away in 1975, and the memorial opened in 1980. While visiting, we witnessed the changing of the guards at noon. The changing of the guards is similar to Arlington’s changing of the guards, but with different techniques. The Taiwanese method seemed a little more flashy, which makes for great photo opportunities. 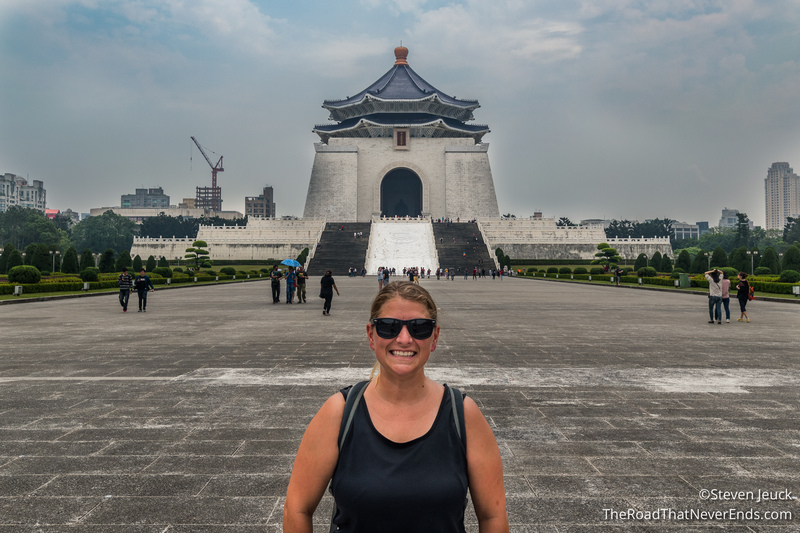 Below the memorial is a museum about Chiang Kai-shek. We found the museum to be very informative. 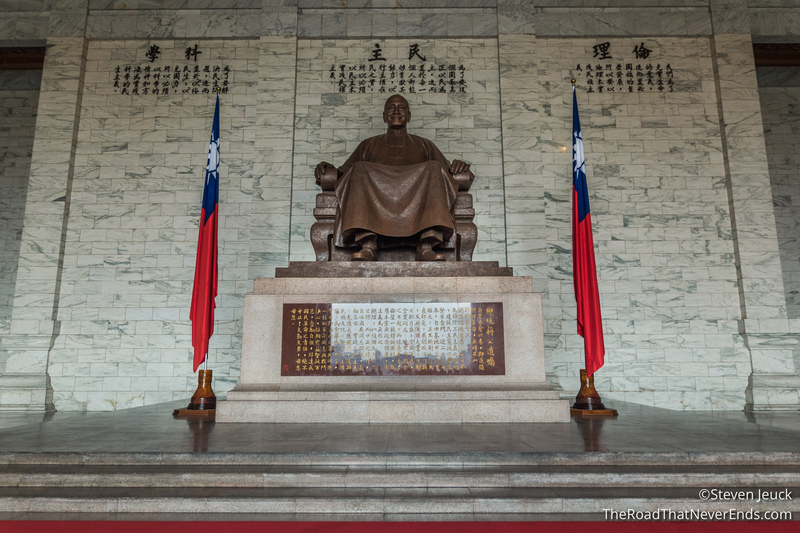 In fact, Taiwan’s complicated history is quite unique. 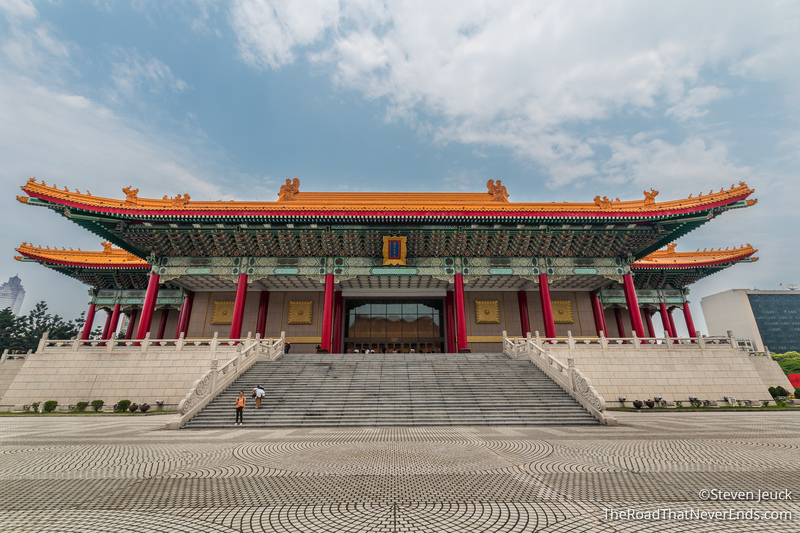 The museum is a bit one-sided from the Taiwanese side, it made us curious what Chinese tourists think when visiting. If you are not familiar with that situation, you can read it here. Elephant Mountain – To get the best view of the city, we wanted to hike the Elephant Mountain trail. The hike was a 15-minute walk upstairs. Sadly, there was too much haze, our view was not that great. 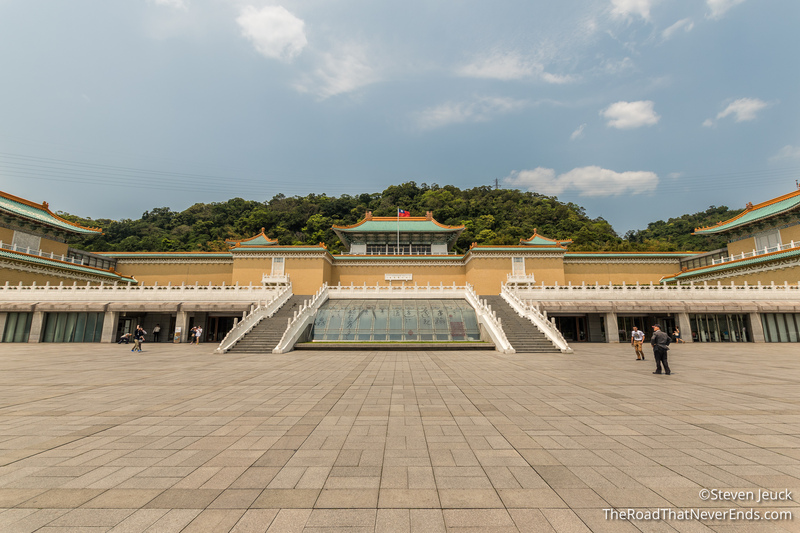 National Palace Museum – This museum has over 700,000 Chinese artifacts. 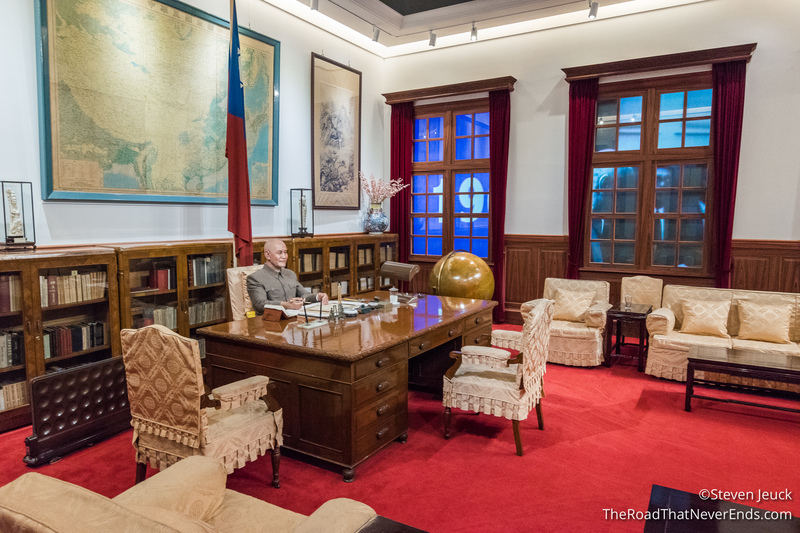 Once housed in Beijing, Chiang Kai-shek moved the items to Taiwan during the Chinese civil war. 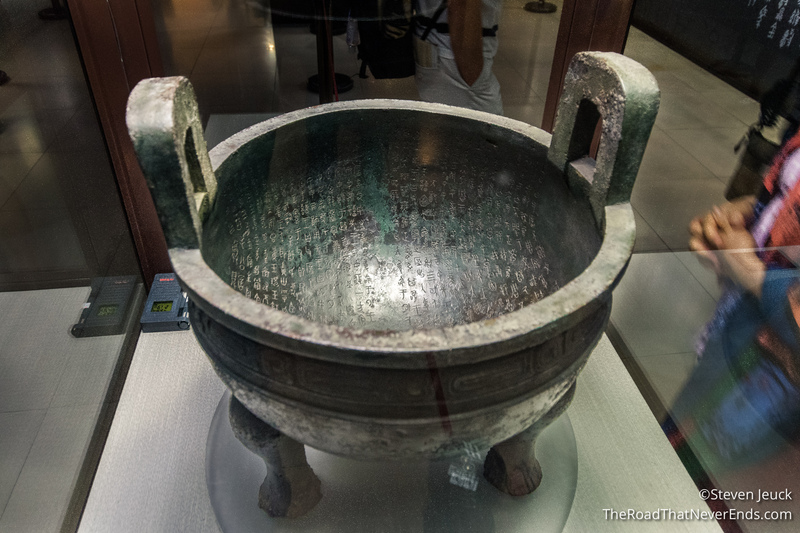 The museum has Chinese art, imperial collections and plenty of jewelry. 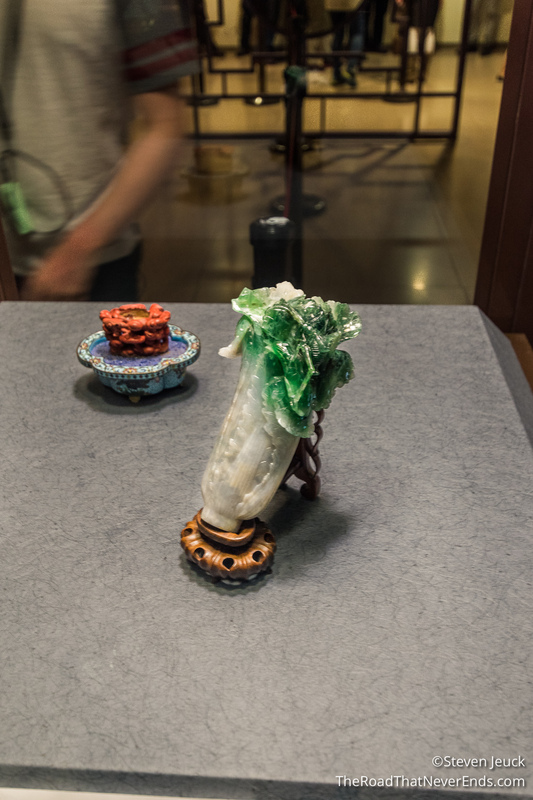 My favorite exhibit was the Jade exhibit. 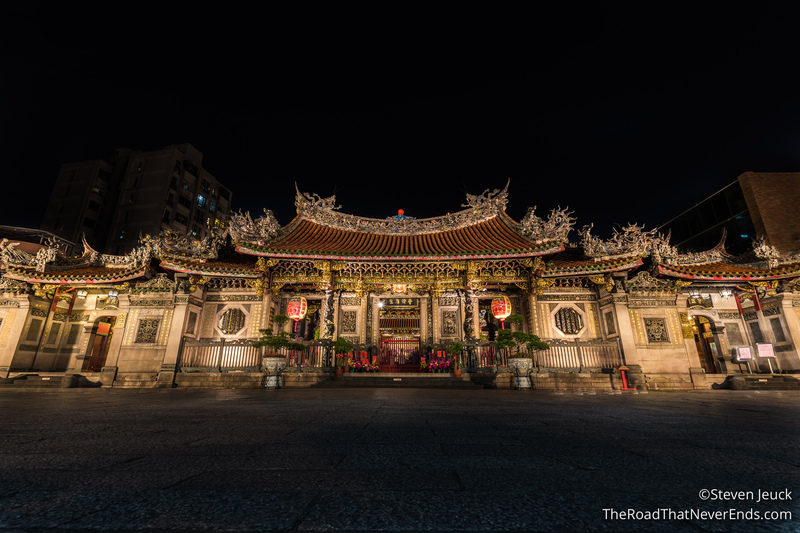 Lungshan Temple – This temple was made in 1738, but rebuilt several times. It was recently renovated after WWII due to an American bombing raid. 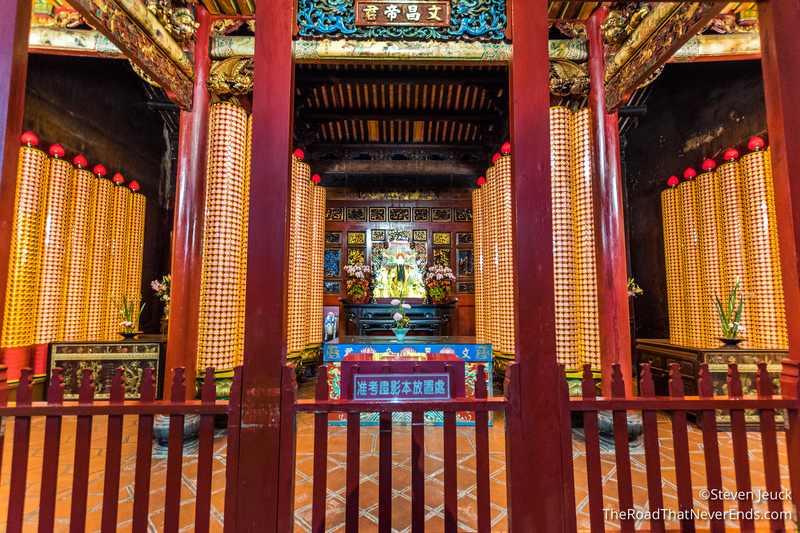 The temple has both Buddhist elements as well as Chinese Gods.